I've got three projects going on now. The blue lace scarf (not significantly changed since the last photo... it's longer, there are more of the leaves in the middle, but it's not that exciting, photograph-wise). The purple DNA (hee) sock. It's also slightly longer, but not all that much because I kept messing up the pattern and then dropping extra stitches when I went back to fix things, and thus I've several times had to redo several rounds. Again, I don't think it's terribly exciting to photograph it inching up my calf. And this. This is some alpaca I bought before I left Colorado. I think my favorite yarn dyer had some, but not this color, and so I actually bought it elsewhere. Basically, its a strand of black, a strand of chocolatey brown, and a strand of camel colored twisted together. The result is a lovely tweedy look that I.. well, I just really liked. Several times this past winter I noticed nice tweedy yarn being used in very simple sweaters or cardigans, ones that were basically all a thick rib stitch (like six by six stitches, as I'm doing here). And so, I thought, that'd be a good thing to do with the alpaca. 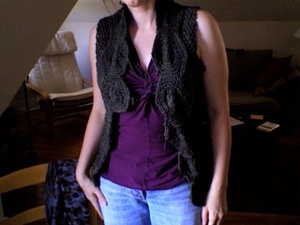 In a cardigan, because alpaca will be warm enough to want to take off easily. It's going fairly well; I'm doing the body all around, and when it gets long enough I'll think further. I'm not going to do any real shaping, because I think it should be a bit boxy. I'm also hoping it's a little drapey, too, and keeping it boxy seems to be a good idea with that. The only "special" thing I'm doing involves the edges. I added an extra six stitches on each end, and those stitches will be bent back and sewed up the side of the last rib, making a flat, double-thick edging up both sides. I have no idea if this will work, and it's making button holes a slight challenge (doing them twice! ), but I think it'll be a better edge than anything else I could think of. I've taken to photographing things in my bedroom, since that seems to have the best light for it (and a crazy wide windowsill, visible above, to make things additionally easier). That means that Ziti often follows me and jumps up to get involved. 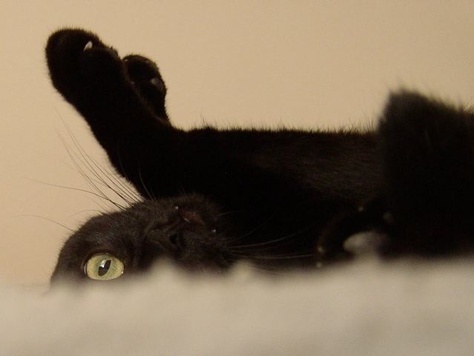 He rolls around and flops upside down. That means, too, that he shows off his claws in need of a trim. 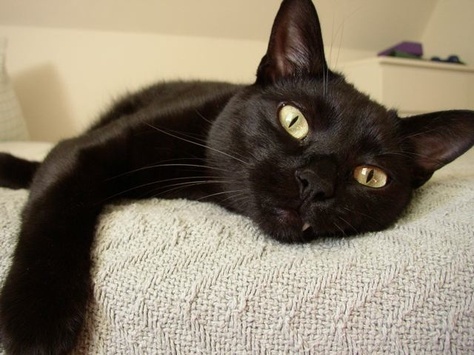 And then he inches closer, and shows off his fangs. Seriously, he's got some wicked fangs, if he ever chose to use them. But fortunately, he's really all about the love. So, the last two weeks have been busy, but this time with travel, not with all the other stuff. Not, of course, that the other academic stuff went away, but the particular business involved going to a conference last weekend (aside from which I got to visit with a college friend), and then heading back to the US for Thanksgiving (first to Chicago for a brief stop at my parents', where shopping and baking happened and I saw a few friends [and the first episode of the current season of The Wire] as well, and then to Madison, for TG itself at my sister's [and, of course, brother-in-law's] new house). Whew. And, of course, there's the whole keeping up with classes and attempting to do a bit of other work, too, none of which is easy when flights and all that loom. But, slowly, it's all getting done. Now, of course, a nice thing about travel is the time to knit. On planes, for example, or otherwise around town. On the various travels, I worked on three projects (though only two warrant pictures). First, and most recently, this. 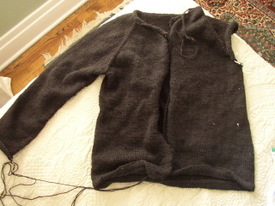 A black alpaca cardigan. Very simple. I'm using yarn I bought from Laura before we both moved from CO, doubled, on size 4 (I think) needles. Yes, it's relatively fine yarn. I'm also trying something new: a top-down raglan design, which is totally intriguing. 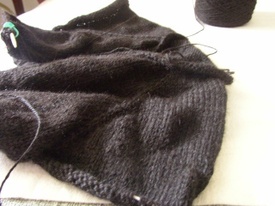 I've gotten the yoke done, have put the sleeve stitches on string, and am now just booking my way through the body. 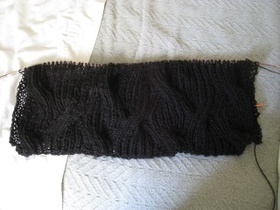 It's sort of awesome, and very good for mindless TV/travel knitting. 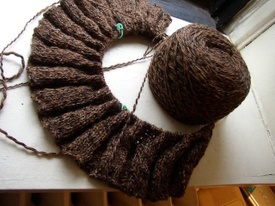 The unshowable project is a new iteration of the Frost Flowers and Leaves shawl, this time doubling the yarn. It works much, much better. I'm nearly done with the first chart, which is all set up, really. Then there are a gazillion repeats of chart 2. And then two different edgings, basically. Yeehaw. Or yipes. One or the other. I'll admit, I'm wanting more immediate gratification, and so the cardigan has been calling me far more frequently. And there's no picture because at this point it's a blueish blob more than anything else. Also, there's another sock, in yarn I bought in Australia. It's actually gently striping, which I didn't expect and am enjoying. 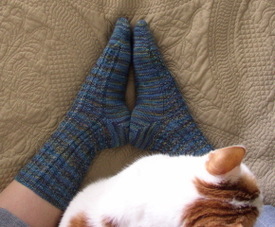 The pattern is an eyelet rib from Barbara Walker. Very very simple, but nicely elastic.